FIRSTDOWN PLAYBOOK CLOSES OUT SEPTEMBER CONVERTING DROPBACK PASSING GAME TO COLOR. 3X1 PASS GAME SECTION TO GET FACELIFT. 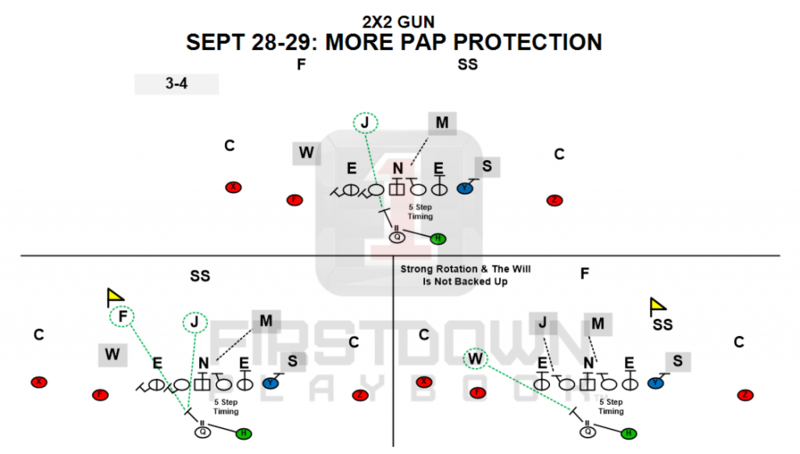 FDPB WILL ALSO PROTECT THE PLAY ACTION PASS GAME UP OUT OF 3×1 AND TWO TIGHT FORMATIONS. FLAG FOOTBALL ALSO ON THE DOCKET AS MORE 6V6 AND 8V8 PLAYS COMING ON SATURDAY AND SUNDAY! Style points count or FirstDown PlayBook would not spend so much time making sure our football plays look the way they do. That’s why we are going to take the time to convert all of our 3×1 pass plays to color on September 26 and 27. Oh yeah, you know how we are, we won’t be able to resist throwing in a new play or two as we work! 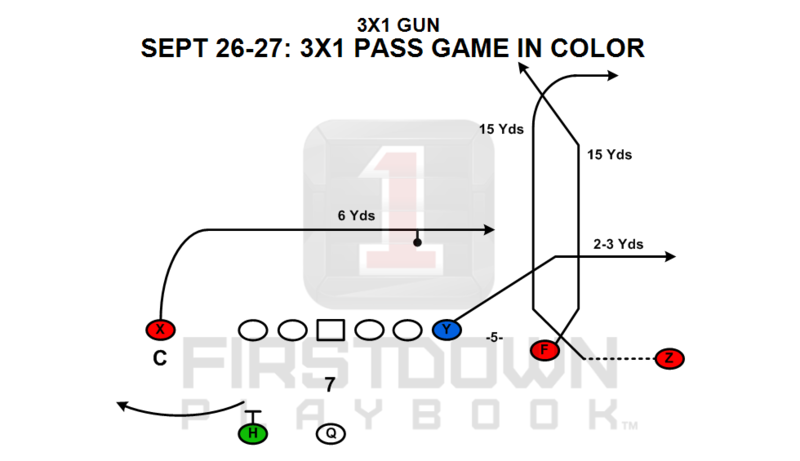 We had a lot of positive feedback about the Play-Action pass protection out of 2×2 last week. This week we will get you the same protection out of 3×1 and two tight end formations. You can be on the lookout for that on Thursday and Friday. Maybe the hardest area, demand wise, that we have to keep up with is Flag Football. You have heard us say here before that there are just so many versions of flag football being played out there that it seems like we are always playing catch up. 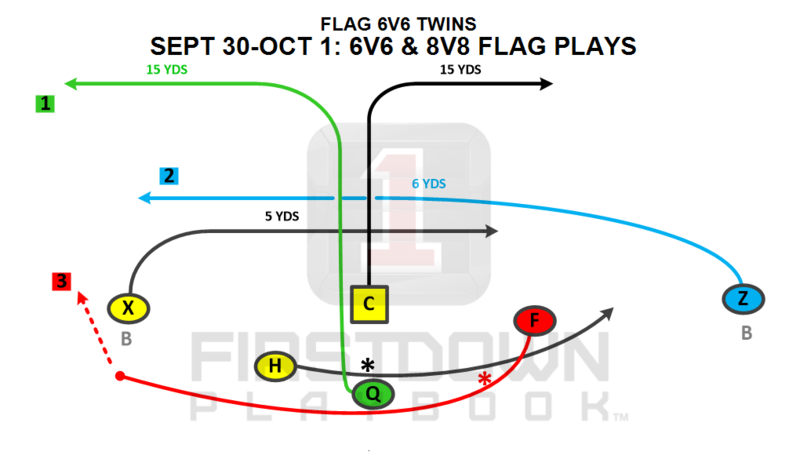 Well, the good news is the FirstDown PlayBook Flag section is just like the rest of FirstDown PlayBook… it never stops growing, so if you hang in there with us you are going to be happy. This week we install 6v6 and 8v8 flag plays as we continue to get those two segments up to speed with the others!